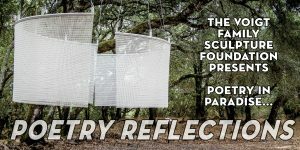 The Voigt Family Sculpture Foundation proudly presents Poetry Reflections, an afternoon of literary delight! It is with great pleasure that we welcome Dana Gioia, Poet Laureate of California and former Chairman of the National Endowment for the Arts and Iris Jamahl Dunkle, Poet Laureate of Sonoma County who will read and perform some of their works in the sculpture grove at, Wind Curtain, created by Ned Kahn. They will also be joined by Poetry Out Loud champions Seryna Bonacorso, from El Molino High School and Sarah Condello, from Analy High School, and youth who recently attended the Poetry Camp at the winery, creating poems from their interpretations of sculptures throughout the current exhibition Geometric Reflections: Ten Years of Voigt Family Sculpture. “Gioia concerns himself with every aspect of his craft: its traditions, its movements toward and away from rhyme and meter, and its ancient roots in the sound of the human voice . . . Gioia is clearly a poet whose words are heard, whose positions ignite debate, whose work constantly and unflinchingly searches out new ways to counter what he calls ‘our sentimental, upbeat age.’” —from the American Book Award citation for his poetry collection Interrogations at Noon. We are pleased to dedicate this event to Dr. Walter Byck, who has so generously welcomed us into this creative partnership with his family and Paradise Ridge Winery. Poetry is the sculpture of language, words coming together to form an artful display of emotion, truth, and beauty. We could not be happier to bring sculpture, verse and, of course, wine together in this splendid setting! Both Dana and Iris will be signing books at the end of the event and books will available to purchase. During the event, light snacks and water will be served and wine will be available to purchase.